Specimen collection numbers SCL 15328 and SCL 15329 in the UBC Herbarium Algae Database. Search the collection numbers in the database for more information on these specimens, or search the species for further occurrences. Images courtesy of Sandra Lindstrom. ​This well-known green seaweed is characterized by flat, green blades that can grow up to 60 cm in height, but are typically less than 30 cm. The blades are two cell-layers thick, with colour varying from very pale to bright emerald green. The blades have small perforations dispersed throughout. Holdfasts are very small and hardly noticeable. In the initial stages of growth, this species grows as a small tube that later collapses on itself to form a two-cell-layered blade. When reproductive, cells at the margins of the blades appear white — indicating cells that have released their spores or gametes and only a cell wall remains. Click here for more images of this species. Dark sea lettuce (Ulvaria obscura var. blyttii) and sea cellophane (Monostroma grevillei var. grevillei) are both green-bladed seaweeds. However, both are one-cell thick, feel more delicate than U. lactuca, and tend to tear when gently rubbed between the fingers. Sea cellophane is light in colour, and more transparent than U. lactuca. It can grow epiphytically, and becomes more yellow in colour when the plant is reproductive. Dark sea lettuce is much darker green than U. lactuca, almost opaque, and tends to occur lower on the shore (low intertidal and subtidal) than U. lactuca. This species grows attached to cobbles, boulders and bedrock in protected and semi-protected habitats. It is common in the mid to low intertidal and in tide pools from the arctic coast of Alaska to California, as well as China, Korea, Japan and Russia. 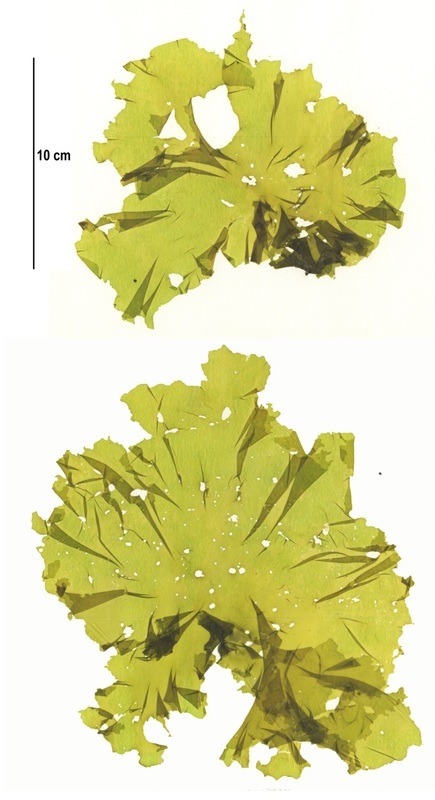 ​Ulva lactuca thrives in areas where nutrient levels are high. High nutrient conditions can result from sewage outfalls, or run off from nearby agricultural areas. This can result in massive sea lettuce blooms that eventually die. As the sea lettuce begins to rot, it consumes nearly all the available oxygen in the area, effectively creating “dead zones” that can cause massive die offs of nearby fish and invertebrates. This massive amount of rotting sea lettuce also gives off a rather unpleasant, pungent odor. 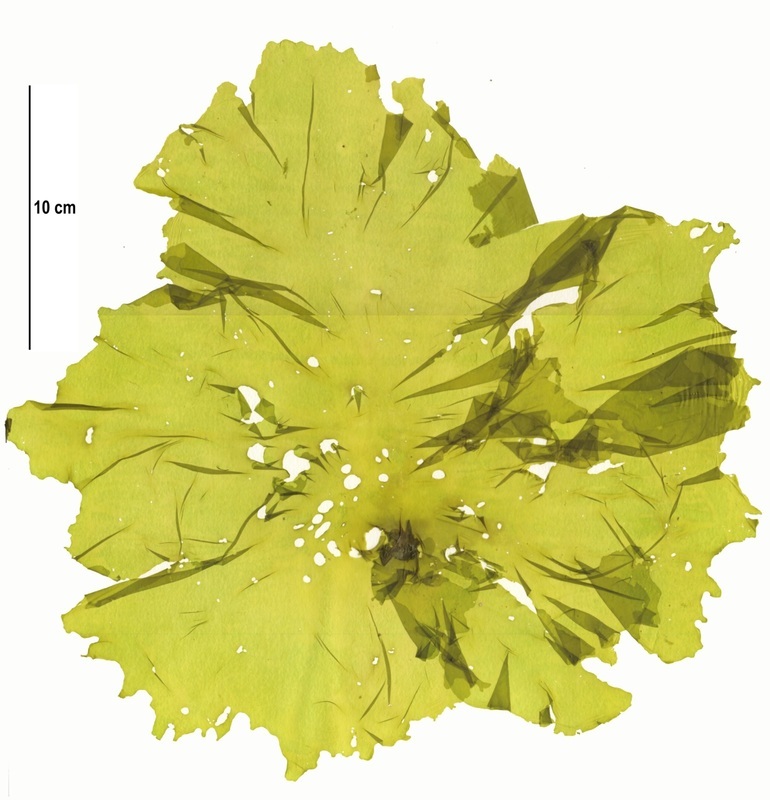 Ulva lactuca is edible and can be consumed fresh, or dried in flakes and powders. It is also processed and used in numerous personal and cosmetic products, including soap, hair care products and facial creams. It is best harvested in the spring and summer, before harsh weather and age leave it too tattered. Seaweed Industry Association (2014). Ulva lactuca. ​Accessed 2015-11-12.